Trust your instincts and enter the duel. Prepare for a fight where only fast decisions and your own willpower can let you defeat your element-commaning opponents. When the time comes, they will try to destroy you! A storm of the battle will break out and the air will tremble with omnipresent magic. Face the challenge and emerge victorious in the end! Don't let your rivals outwit you! 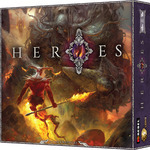 Heroes is a dynamic real-time game for 2-4 players, in which players become true heroes of a magical fantasy world, possessing great powers related to different elements: air, water, fire, etc. and leading powerful fantasy armies. They send their creatures — such as dragons, elementals, ifrits, hydras or gnomes — to a battle against the opponent's troops. The aim of the game is to defeat the opponent's hero and army. In each battle you will summon the mighty forces of nature and the beasts which were born from them. You will chose on your own which of them will accompany you in tides of battle. Using magic dice you will cast spells or dispel those belonging to your enemies, activate your foes or learn new magic incantations. Perceptivness, reflexes and a well-thought-out strategy are the keys to victory. One of key tasks for each player is to properly use of any cards that he own and creatures that he controls. He must quickly analyze scores on his dice because only given sets of symbols will allow him to use abilities and cast spells.